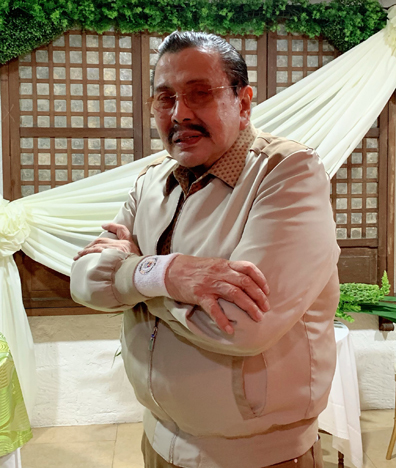 Former President and current Manila Mayor Joseph “Erap” Estrada considers the city as his first love. And it is expected since he was born and grew up in Manila. But it’s common knowledge that starring in movies also holds a special place in his heart. In his heyday between 1956 and 1989, Erap played the lead role in more than 150 movies, and was producer of over 70 films. He had cameo roles in May Isang Tsuper ng Taxi in 1991 and in The Four Stooges in 1995. He returned to the big screen in 2009 in Ang Tanging Pamilya, his comeback movie after a 20-year hiatus. The blockbuster film also starred Ai-Ai delas Alas and featured Sam Milby, Toni Gonzaga, and Dionisia Pacquiao in her first film portrayal. 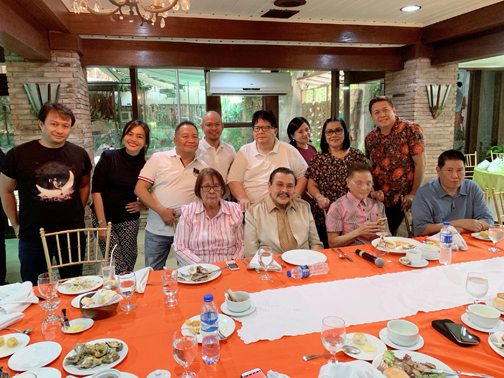 In an intimate lunch with entertainment editors and select members of movie press yesterday, the 81-year-old actor-politician went down memory lane and talked about his career as a movie star, including his fond memories and friendship with the late Fernando Poe, Jr..
“Back then, everybody in the movies was mestizo, sila FPJ. I was the only one who’s very Pinoy. Kaya nga naging favorite ako ng masa. It was the poor who catapulted my career as an actor,” Erap recalled. Senior showbiz reporters shared that the octogenarian has made notable films and that he should restore these cinema gems to immortalize his contribution to the local industry. “Unfortunately, most of these films are now gone. Nang binaha ang film center, napasama,” he said. Erap is seeking re-election in the country’s capital city. If he wins, he will be serving his third term. “When we took over, the city had a P4-billion debt. We were able to pay that off and we’ve done so many things in Manila and I would like to continue doing those projects if I get reelected. I’d like the city to reclaim its nickname as the Pearl of the Orient. That’s my vision for my last term, which I consider as my last hurrah,too,” Erap affirmed. This statement prompted Ethel Ramos, considered as Dean of entertainment journalist, to ask whether or not he’s keen on making another film, which will sort of become his “last hurrah” in showbiz. “I have a fitting title for that film, how does Markang Erap sound?,” the senior showbiz journalist inquired. “You know, I’d like to keep an image. I’m too old to do films. If I’d do one, sasabihin ng mga tao, ‘ay antanda na ni Erap, ganun na na yung mukha.’ I’d like them to remember me for the films I did in the past. I’d like them to remember me for the roles I portrayed when I was younger. Let’s leave making movies to younger actors,” he retorted. Considered as one of the pillars of Philippine Cinema, Erap in 1974 founded the Movie Workers Welfare Foundation (Mowelfund), which helps movie makers through medical reimbursements, hospitalization, surgery and death benefits, livelihood, and alternative income opportunities and housing. Its educational arm, the Mowelfund Film Institute, has produced some of the most skilled and respected producers, filmmakers, writers and performers in both the independent and mainstream sectors of the industry since its inception in 1979. He also founded, together with Dr. Guillermo De Vega, the first Metro Manila Film Festival in 1975. “I’m glad that up until now, Mowelfund is able to help our colleagues in the industry. I feel great that the institution continuous its mission the way we envisioned it,” he noted. Meanwhile, Erap is turning 82 on April 19, asked whether he’s going to have a big party, he just said that it’s going to be an ordinary day. “It’s Holy Week. So it’s going to be a quite celebration,” he ended. GMA News Pillar Vicky Morales is looking forward to more years as a loyal Kapuso after renewing her contract with GMA Network on March 21. 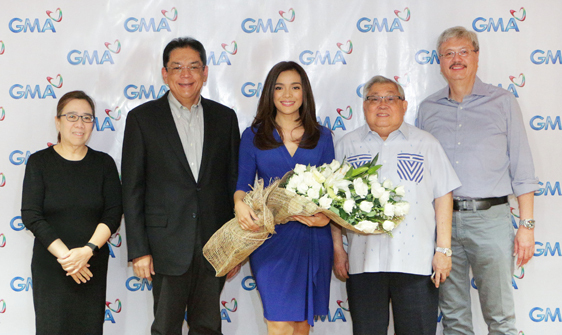 From left: GMA Network SVP for News and Public Affairs Marissa L. Flores; President and COO Gilberto R. Duavit, Jr.; GMA News Pillar Vicky Morales; GMA Chairman and CEO Felipe L. Gozon; and EVP and CFO Felipe S. Yalong. Joining Morales in the signing were GMA Network Chairman and Chief Executive Officer Felipe L. Gozon; President and Chief Operating Officer Gilberto R. Duavit, Jr.; Executive Vice President and Chief Financial Officer Felipe S. Yalong; and Senior Vice President for News and Public Affairs Marissa L. Flores. The 24 Oras anchor proudly shared that in the three decades of being a broadcast journalist, she has always considered GMA Network as her second home. On the part of GMA Network, Atty. Gozon says he could not be any prouder of the Wish Ko Lang host. “Si Vicky ay tunay na homegrown. Sa simula’t-sapul dito na siya nag-umpisa at isa na siya sa mga pillar ng ating News and Public Affairs group,” he says, adding how Morales continues to lead top-rating programs up to now. “Lahat naman ng programa ni Vicky dito sa atin ay matataas ang rating. Kaya tayo ay talagang nagagalak na nag-renew na naman si Vicky,” he ends. Morales, who co-anchors GMA’s flagship newscast 24 Oras with Mike Enriquez and Mel Tiangco, also hosts the pioneering public service program Wish Ko Lang. On GMA News TV, Morales spreads positive vibes as host of the magazine program Good News. Morales was recently hailed as the Best Female News Anchor at the 2019 Paragala: Central Luzon Media Awards. Last year, she also won as the Most Outstanding Female News Presenter of the Year at the COMGUILD’s 12th Annual Conference of Journalism and Mass Communication Students of the Philippines. For Wish Ko Lang, Morales was awarded as the Best Public Service Program Host at the 32nd PMPC Star Awards and received the Pinakamagiting na Personalidad ng Public Service Program honor at the 6th Kagitingan Awards for Television.